National Public Radio Headquarters, Washington, D.C.
At Body Shop's U.S. Headquarters by Design Harmony, the entry features indigenous vegetation and solar-based orientation. 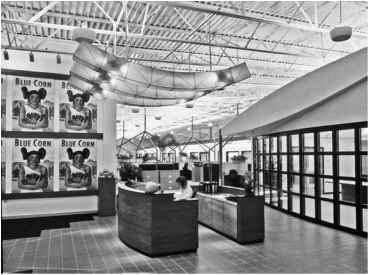 The interior of Body Shop's U.S. Headquarters provides simple, flexible space with natural light and ventilation. 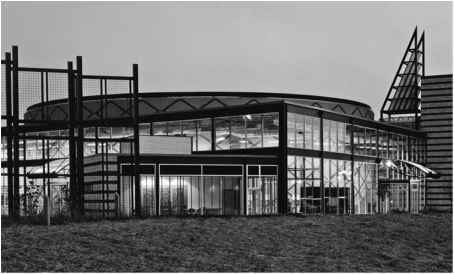 Herman Miller "Greenhouse" Factory & Offices was designed by William McDonough + Partners to consider the health of the workers inside as well as the integration of the building into the landscape. 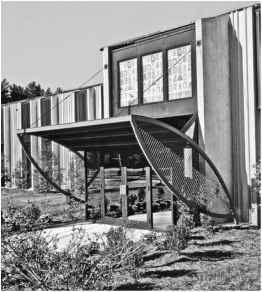 The Natural Resources Defense Council Headquarters (NRDC), completed in 1988 by Croxton Collaborative Architects, stands today as the seminal project that turned the tide toward green architecture in America by addressing the full ecology of the building: light, air, energy, and human health and well-being. Sustainable design goals and the selection of resource-efficient building systems and materials were encouraged for the National Public Radio (NPR) building, provided that these features contributed to a healthy, productive working environment, and did not significantly add cost. 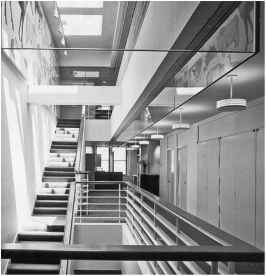 The NPR Headquarters by Burt Hill required major renovation of a 25-year-old former commercial office building. The Way Station, located in the heart of the Frederick Historic District, was designed by The ENSAR Group, Inc., to complement the neighborhood. It is organized around a central light court with a large garden where the primary building circulation occurs. This project originated as a multidisciplinary graduate student environmental design project and was then brought to reality through a series of private grants. The team leader was the late John T. Lyle, who was a fellow of ASLA and a professor at the Center for Regenerative Studies. The project has been renamed in his memory. The client representative was Marvin Malecha, FAIA, who was then dean of the College of Environmental Design at California State Polytechnic University, Pomona. The mission of ecological regeneration was integrated into the planning and design of the Center for Regenerative Studies. Regenerative Studies is home to an environmental program of study at the university that is faculty- and student-driven. The site is subject to heavy use, and this was initially a concern to university trustees. They predicted a slowly deteriorating site, with mosquitoes in the aquaculture ponds and unkempt grounds. The reverse has been true. There is a distinct sense of place, opportunity, and community at the center. Students and faculty are using every available approach to explore alternative solutions to environmental problems. 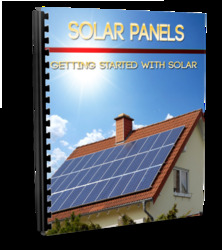 Many students are inspired to study ways to design and construct such projects as solar panels, solar ovens, composters, and irrigation systems and to conduct agricultural experiments. In this way, the environmental performance has been enhanced, just as it was envisioned. This project has taken on a life of its own, and it continues to evolve as an academic setting for environmental research. At the time this school was designed, the firm had specialized in energy design and had experienced considerable success with daylit schools in the adjacent county. Durant Road Middle School is the first school in the county to comply with ASHRAE's 15 cubic feet per minute (cfm) perperson guideline. Daylight illuminates the gym during the day. Their energy performance, as well as the indoor environment, was excellent, and the schools were used as a regional benchmark. This was a major factor in Wake County Schools' decision to hire the architectural firm. 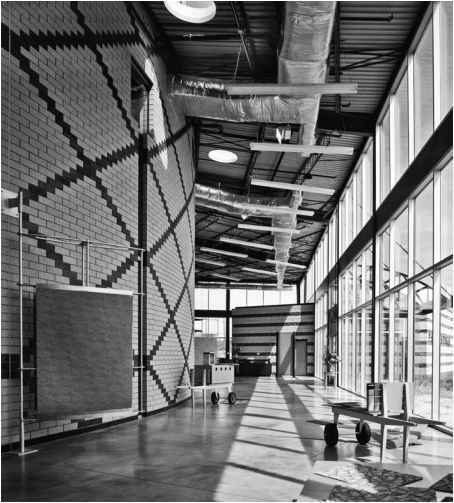 Client and architects adopted the then-current version of North Carolina's High Performance Guidelines (very similar to Leadership in Energy and Environmental Design, or LEED, but with more state-appropriate variations). 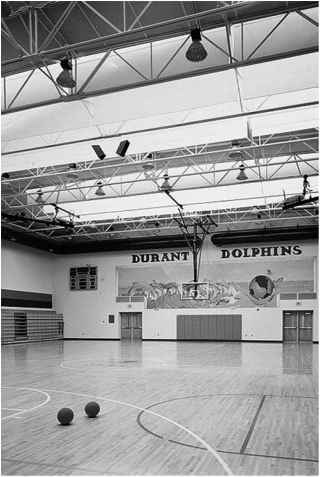 Durant Middle School was completed in 1995 for use as a year-round school (with the resulting increase in energy and operating requirements). It was the first school in the county to comply with ASHRAE's 15 cubic feet per minute (cfm) per-person guideline. In 1995 the school consumed $0.84 per square foot per year in energy bills. 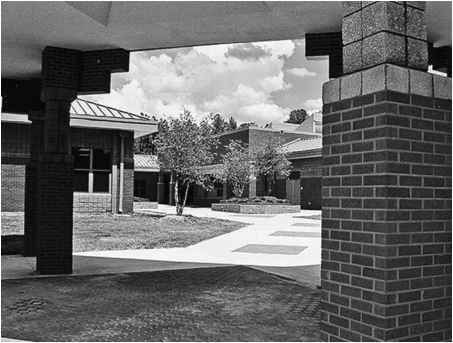 This compared at that time to $1.34 per square foot for the typical year-round school in this area of North Carolina that also complies with the 15 cfm ASHRAE standard. Since that time, a considerable number of mobile classrooms have been added to the campus, and Sunday church services within the school have increased; but the energy costs, excluding the mobiles, have been maintained and actually have improved, ranging from 10 percent below the first-year (1995) usage to $0.73 (2003-2004). Performance in some classrooms has been reduced due to lack of maintenance and lack of use of the operable shades in those classrooms. Such maintenance details and staff operational practices have to be continually addressed. 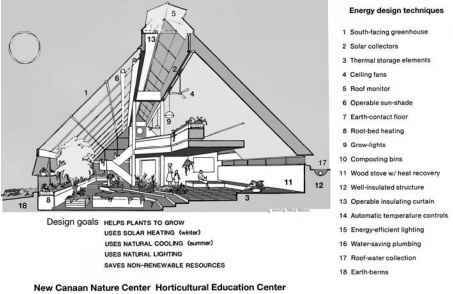 In 1981, when the program was formulated, the client established that the building should be a prototype to demonstrate and promote energy-efficient greenhouse design, and it would be combined with classrooms and offices. The program and design concepts were subject to extensive research, including a survey of similar projects internationally, computer and daylight modeling, and consultations with experts in mechanical systems, construction, and horticulture. 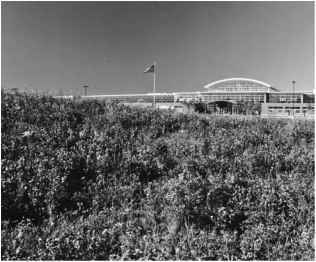 One of the early green demonstration projects of the 1980s, the project received numerous awards for design and energy innovation. For more information about the center, visit its Web site at http://www.newcanaannature.org. 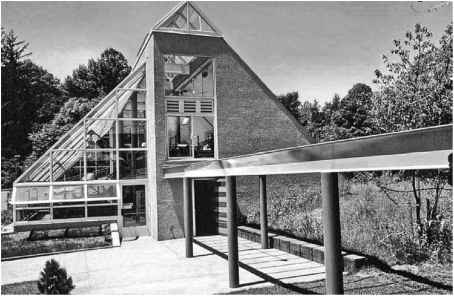 The program and design concepts of the New Canaan Nature Center Horticultural Education Center were subject to extensive research, including a survey of similar projects internationally, computer and daylight modeling, and consultations with experts in mechanical systems, construction, and horticulture. The passive aspects of the design (i.e., thermal mass and earth berms) have proven both economical and durable in the New Canaan Building. Completed in 1983, the project has been in operation for more than 25 years. Energy consumption was documented for several years, and revealed that actual utilization exceeded the energy reduction anticipated by computer simulations. The building has been evaluated in a series of postoccupancy studies, at two, five, and ten years after inauguration. These evaluations offered a number of lessons. Some features originally installed for energy conservation are no longer operated: for example, a solar hot-water system installed in 1983 was little used and has been disconnected; a large, insulating shade (70 ft. long X 40 ft. high) originally installed to operate automatically now runs by operator switch controls. Other features have proven durable. One of the innovations used was root-bed heating; innovative at the time, it now has been adopted widely in greenhouses in the northeastern United States as an energy-efficient technique to maintain healthy planting environments. 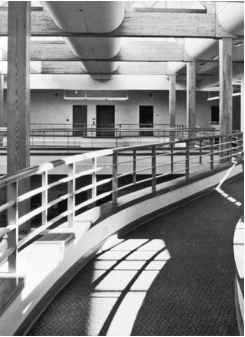 ■ The building circulation is designed as a visitor tour, with movement through the building providing sequential openings and views, as in a forest. 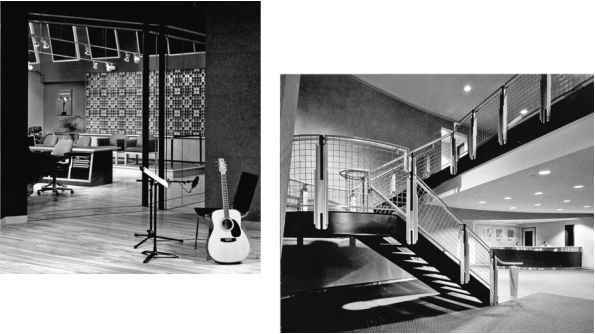 Interactive exhibits that explained the energy features of the design were innovative at the time of the building's opening. These were removed after a decade to make room for gardening programs. ■ The nonmoving aspects of the design (i.e., passive design, thermal mass, and earth berms) have proven both economical and durable. The moving parts, such as the insulating shade, have proven to be a challenge. The long-term lesson is "Keep It (Very) Simple." ■ Our firm adopted solar energy and environmental design as a primary focus of a teaching and research-based practice beginning in the mid-1960s. We continue this focus still. Great emphasis is given to the programming and preschematic phases, in establishing parameters of performance and reducing liability and costs, seeking double- and triple-use opportunities and natural fit with the given climate and context. In this project, the large greenhouse is essentially a multiuse atrium space for plants and people, serving as a horticultural greenhouse, a reception area for events, a place for exhibits, a garden gift shop, and an educational classroom. ■ Design architect of the project, Donald Watson, FAIA, sums up lessons as: "Delve diligently into all design options. Test carefully, and adopt new approaches with vigilance. Seek advice from a wide range of experts. Be ever patient with the client. Use the process to educate yourself and others. Follow up with [a] thorough evaluation. Be honest about mistakes and lessons learned. Be modest before the complexity and wonder of nature." Activity is shared visually at Prince Street Technologies through the generous use of glass, from the plant, design studio, offices, and conference rooms to showrooms on the outside radius. The Prince Street Technologies facility provides a work environment that conveys a sense of family and emphasizes teamwork. It is a marketing tool for its products, while reflecting the client's commitment to the environment. should provide a work environment that conveyed a sense of family and emphasized teamwork; be a marketing tool for its products; and reflect the client's commitment to the environment. crete floor panels for maximum energy efficiency. Other environmental concerns are addressed by the use of low-maintenance landscape and simple building materials that are underfinished. The facility was used less than five years. After only a couple of those years, Prince Street combined its broadloom-manufacturing processes with Bentley, the company's other top-tier carpet line. All of the production was moved to an existing Bentley facility in California. 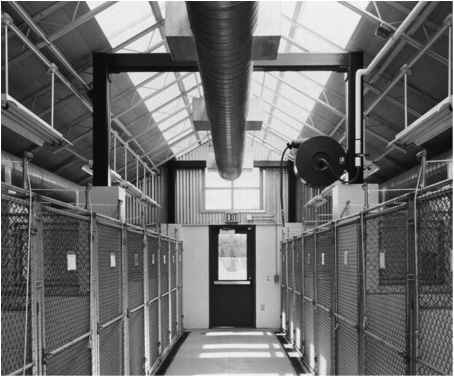 The energy performance of the Women's Humane Society Animal Shelter has been tracked, and its performance is better than was anticipated in the computer modeling. 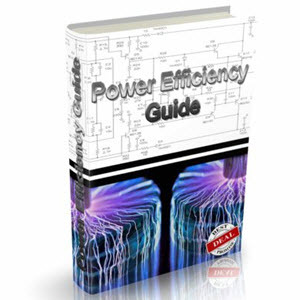 mine energy-efficient strategies for it. 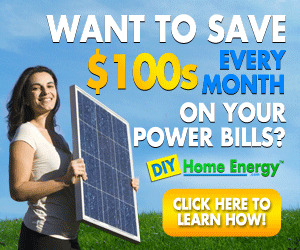 When it came to budget cutting, the client did not eliminate any of the energy-saving strategies.